Geneva, Switzerland, January 23, 2018 – The international blockchain company, DECENT, announces a new partnership with bardicredit, a company working to be one of the first EU-approved investment funds running on blockchain. The companies will engage in transforming and improving the investment fund industry through tokenization – integrating and leveraging blockchain technology in the field of finance. 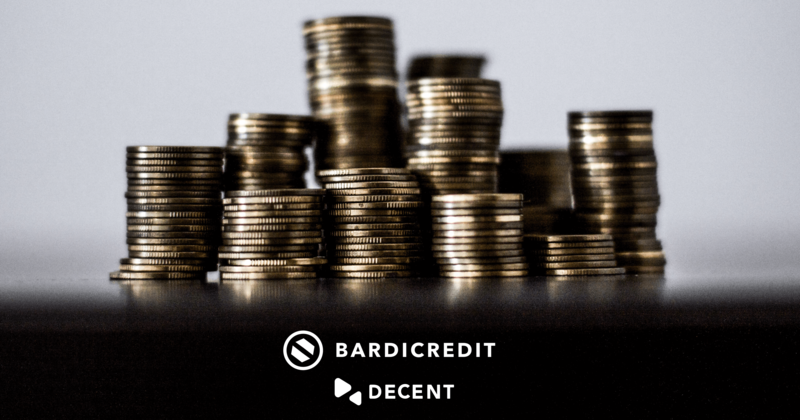 Bardicredit aims to be the first EU-approved tokenized investment fund on a mission to open the world of venture capitalists to a much larger investor audience. To help bardicredit achieve this goal, DECENT will provide its advanced, proprietary blockchain platform, DCore. The fund’s plan is to invest in commercial blockchain applications powered by DECENT’s advanced blockchain protocol, DCore. Bardicredit will apply the concept of tokenization to enable investors to hold even a small and tradable stake in the fund. The company wants to make use of this modern and emerging technology and claims that high-performing commercial platforms, such as DCore, will be highly sought after and have a strong future. Before bardicredit, George Salapa worked in consulting (PwC) and banking (Sberbank), co-founded a startup and contributed as a guest writer for Forbes. With the public being constantly exposed to the emerging power of blockchain and its real-world use cases, bardicredit aims to use the innovative technology of DCore in a variety of no-nonsense blockchain commercial applications. The company also believes that DCore is a great fit for standalone ventures and blockchain-ready technology companies that can be elevated through blockchain via “Blockchain-as-a-Service”. Bardicredit will also invest in ‘on-demand’ companies in the sharing economy space. For these “UBER-like” businesses, the model of internal tokenization will function as an enabler of frictionless payments for their customers and a means to raise additional capital. The company, therefore, postulates that a phenomenon called a “reverse ICO” will enable many viable start-ups in the ‘on-demand’ economy (providing consumers with immediate access to goods and services) to flourish. Reverse ICOs are a crowdsourcing method where already existing, real-world businesses raise funds as they launch their own cryptocurrency. Investors deem this form of funding much safer than regular ICOs and are more inclined to participate since the companies they are investing in have already established viable products, gaining the trust of investors worldwide. As for the fund structure, bardicredit established themselves in Switzerland and Liechtenstein due to their strict, but progressive regulations. The aim is to combine the safety and investment certainty offered by these countries with an added layer of revolutionary technology enabled by tokenization. Currently, bardicredit is holding an equity round for Q1 of 2019.